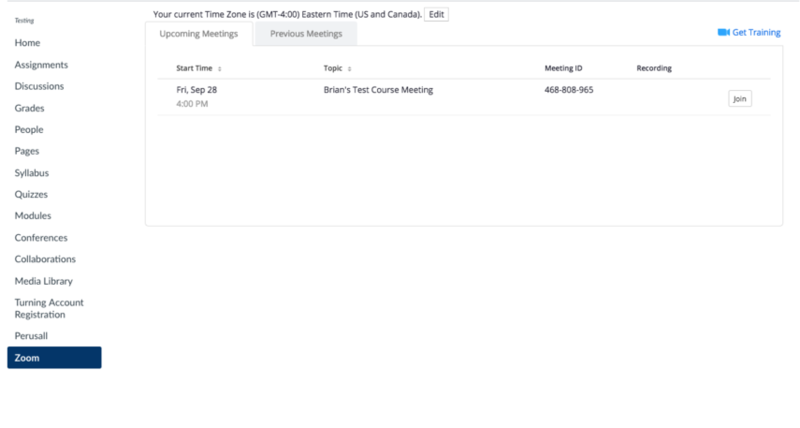 Zoom within Canvas allow you to schedule and display meetings directly in your Canvas course page. Students can view upcoming Zoom sessions and join them from the Zoom section within your course. Zoom is hidden by default within Canvas courses. 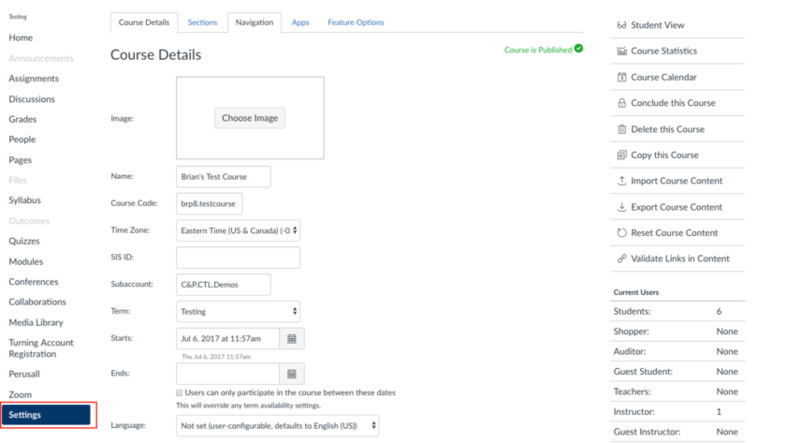 If you wish to use Zoom in Canvas, you will first need to navigate to the settings tab on your course page. Then navigate to the "Navigation" tab, drag the Zoom item from the lower list to the upper list of active course items and click "save". Zoom will now appear in your left hand course navigation menu. 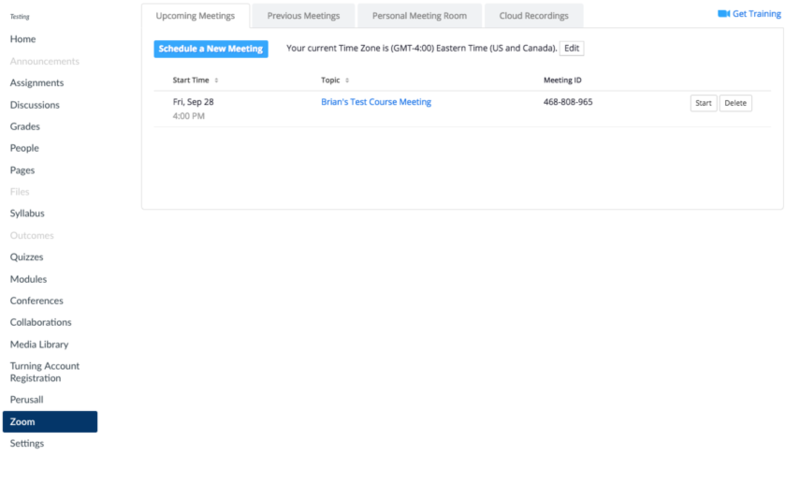 Zoom Meetings can be scheduled from within your Canvas Course. You can access the Zoom for Canvas tool from the navigation area for the course. The landing page shows information on upcoming meetings and previous meetings. To begin scheduling a session to appear on your Canvas page click the "Schedule a New Meeting" button. 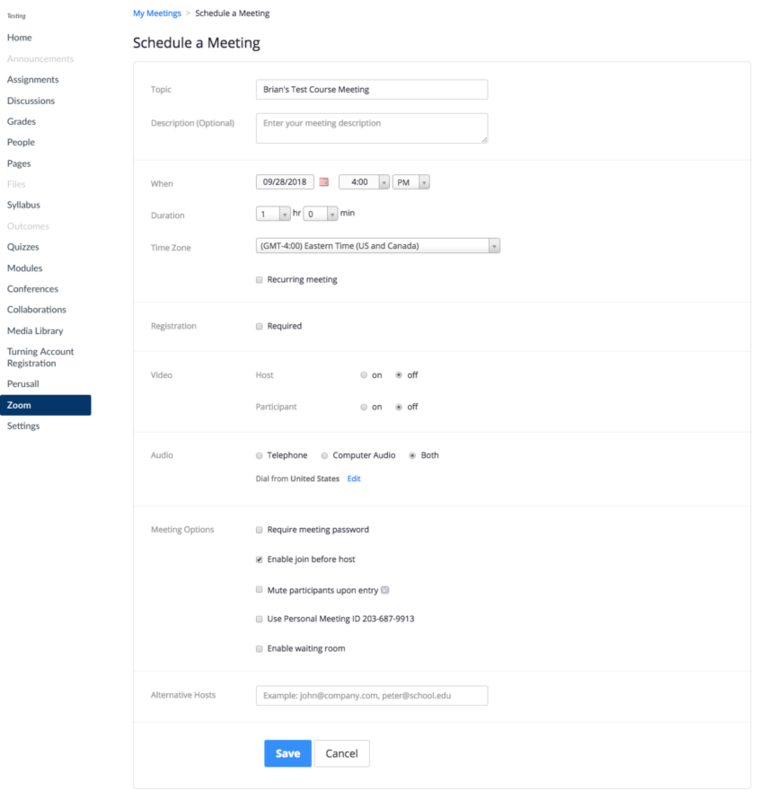 Once you have selected "Schedule a New Meeting" you will be brought to a page to enter the meeting information such as the time and name of the meeting. 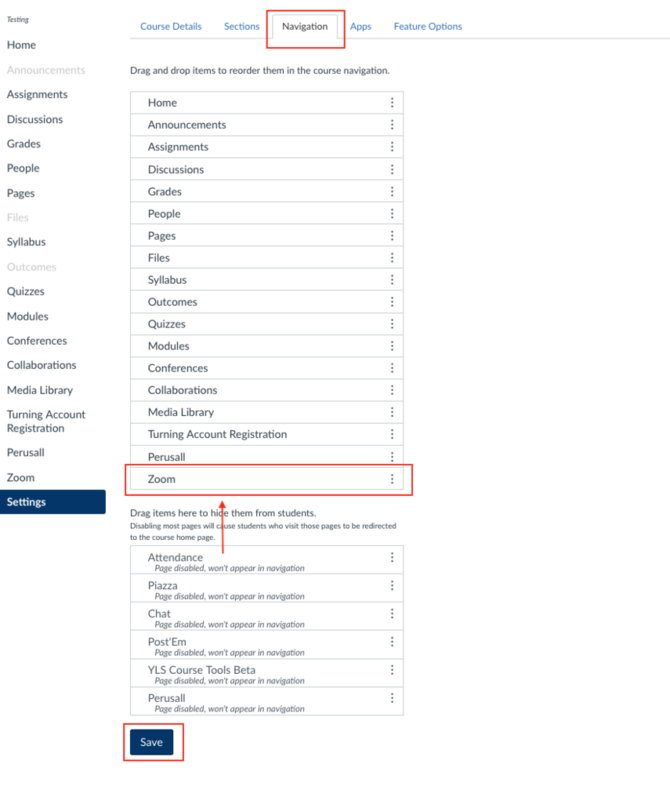 If this will be a regularly occurring session, you can select "Recurring Meeting" and enter the necessary information. Once you fill out the necessary information and click "Save", you will be brought to a screen confirming the details of your meeting settings. As the host of the meeting you will see tabs for your upcoming meetings, previous meetings, personal meeting room and cloud recordings. Please note that your upcoming meetings will list all meetings associated with your account, not just the ones scheduled through Canvas. Likewise, the cloud recording tab will list all associated recordings with your account. The personal meeting room and cloud recording tabs are not visible to students. Additionally, if another instructor or TA schedules a meeting in the class it will appear in the list of upcoming meetings for students, but not for the host. You can always view the Zoom tab in student view to confirm what students will see. Students will only see tabs for upcoming meetings and previous meetings and do not have the ability to schedule meetings in the class. 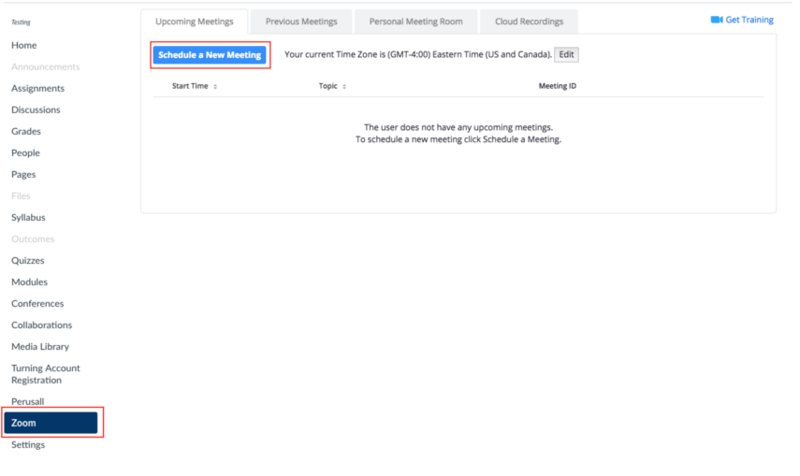 Currently, the recordings column will not display session recordings if you have recorded your meeting. If you wish to make a recording available to your students, you can download the recording from Zoom and upload in the Media Library.